I truly love to prepare a healthy home-cooked meal for my family as much as possible, but what I don’t love is the clean-up after the meal is done and everyone else has left the kitchen. A few years ago I got an amazing deal on a beautiful set of Cuisinart stainless steel pots and pans, my first time ever having high quality cookware in my kitchen. While I was, and still am, grateful to have this gorgeous set of pans, they require a bit more love and attention to keep them looking all pretty and shiny. It’s worth it, though, and much easier than you might think! First and foremost, if you are like me and hate to clean up the kitchen all by yourself after a family dinner, it is important to create a positive and fun environment to get yourself through this necessary chore. CRANK UP THE TUNES! I always grab my iPad, bring it with me to the kitchen, and turn on the Pandora music app. Nothing makes work a bit more tolerable than some really great music. I have heard people say, on more than one occasion, that they also love their stainless steel pots and pans, but they get frustrated when it comes to cleaning them. The key is to be patient and follow a few simple steps and your cookware will always look like it just came out of the box! Lovely, right? What with all that stuck on goodness that remained from my homemade Spanish Rice. Here’s the thing. If I tried to get that clean right away, I’d get frustrated because it would take forever to scrub everything out of that pan, so the first thing I do is fill the pan with hot, soapy water and set it aside while I get started on cleaning everything else. After about fifteen minutes something truly magical happens. All of the yucky stuff begins to lift away from the pan and I can easily wipe it away with a sponge! The only problem is that then I am often left with a pan that looks like this, especially if anything tomato-based has been prepared. Do have pans that look like this? Have you ever thought, “how the heck do I get rid of that ugly rainbow in the bottom of my beautiful pan?” I have the answer that will literally change your life. I’m not kidding, IT WILL CHANGE YOUR LIFE! Okay, listen. Sometimes I get really excited about big things in life, like hearing my name called to Come on Down on The Price is Right, but things like that just don’t happen every day so I also get really excited about the little things that make my life easier and my stainless steel pots and pans prettier. And now for my tip that will change your life, like big time. After you scrub and clean a pan and grumble to yourself about how that ugly prism-looking stain seemingly came from out of nowhere, there’s a trick to make it disappear in nearly an instant. 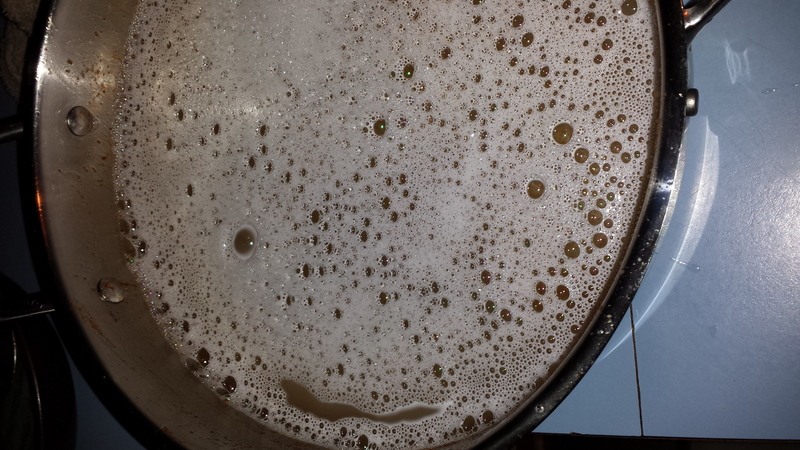 First, I leave enough warm water in the pan just to cover the bottom. Then I add a splash of white vinegar and allow it to sit for a minute or two. Finally, I rinse out the pan and dry it and voila! It looks as good as new. I wish I had another picture for you, but I don’t. I promise it works, though. Just use your imagination and envision a shiny, silvery pan that looks at good as the day you purchased it! Oh, one more thing. If you have more than one pan with the rainbow stain, just follow the steps above, but instead of rinsing out the pan, just transfer the water/vinegar mixture to your other stained pot. Can you believe the secret is something as simple as vinegar, which you probably already have in your kitchen?!?! Truly though, you don’t have to thank me because it is my pleasure to share my expert advice with you. I mean, my head might burst if I kept all that wisdom bottled up inside. Well, thought my stainless steel pots& pans were ruined forever. Thank you..???? I have been panicking too, already threw away few pots and noticed my new once are having exactly the same problem. So huge thanks for this, especially because do not have to use any harsh chemicals. Thanks so much for the comment, Sarah. I’m really glad my tips worked for you! they worked like magic. i couldnt believe it. perhaps you have a solution for the coloring on the base where the heat contacts the pot? THANK YOU…THANK YOU in saving my favorite cooking pans. We novice parties appreciate the “help/assistance” you bestow us ! I have always used Cameo cleanser. It’s non-abrasive and specially formulated for stainless steel. My pots look almost new and they’re 8 yrs old. It’s great for removing black burnt on stains from cooking with a gas stove. I was looking for a way to clean a Cuisinart pot that had a rainbow in the inside of the bottom of the pot. My sister had cooked some cabbage in the said pot. I googled and there was your tip. I tried the warm water and splash of vinegar and guess what it worked. The pot looks new again. Thanks. I’m so glad my post was helpful and that your pots look beautiful once again. Thank you for visiting and for leaving such a sweet comment. Thanks so much for taking the time to leave this comment, Rhonda. I’m so glad my simple trick for worked for you! Hi Cathy, I have (supposedly) titanium pans, and it also has rainbow colour after washing. Does your trick works for it as well? I honestly don’t know, Ronelin, but since vinegar is pretty safe and natural I’d think you could give it a shot. Good luck! YES….it worked… Ty Ty Ty…hundred times Thank You…. Hi Christa! Thank you so much for your initial comment and especially for your update! I’m so very glad this worked for you and that you didn’t have to return your beautiful new pots and pans. Thanks again for stopping by and for taking the time to leave a comment. Yes, thank you so much! Another site said to use Bar Keeper’s Friend, but the vinegar trick is so much easier! Fabulous! I’m so glad to hear this worked for you! Thank you so much for the comment, Karen! I’m so glad it worked for you, Suzanne. Thanks so much for the comment! Any suggestions for when I get the stainless steel pans over heated or burn a sauce . The challenges to remove a blackened burnt on surface is driving me crazy. I know that chef in a restaurant just say the pan is now seasoned. what If I want pans that look new as the day of purchase . Any suggestions? I can’t thank you enough just purchased 4steller stainless Steele pans cost£175 used ones and got the rainbow inside I could have cried then I seen your post alls well again thank you . My husband purchased my Cuisinart Pots and Pan set in the late 70’s. It is still beautiful and has had much use. It has a 50 year warranty and still looks new. A friend of mine used the small pot to cook a sweet potato. She forgot it and burned it real bad. I am now struggling to get it cleaned. I have burned a number of times but this is the worst. I’m hoping it will come clean. I am using white vinegar and scouring it. Yikes, Mary! Fingers crossed you’re able to save your pans! Wonderful news, Mary. Thanks so much for sharing! I tried this and it didn’t do anything. I’m so sorry to hear that, Carole. Maybe try it again and allow it to sit a little longer next time. Carole, I have a Cuisinart SS set, also. I have used this method on all my pans, and most of the time it works perfectly. However I have one deep skillet/pan that still has the “yellow rainbow” even after heating with water, vinegar method; as well as straight vinegar simmer on the stove. Bartenders Friend method was in vain, as well. Even though the pan is squeekly clean, it still has the “yellow rainbow” but it doesn’t effect the cooking ability. I will not lose any sleep over it, though…LoL ! Hope this was helpful and good luck! I tried the vinegar and water for the bluish rainbow stain and it didn’t do anything. I tried this and it didn’t get all of it …. So I left it a little longer….It worked… Also had a sauce pot that I have had for 30 years. (My dad bought it for me when I first move from home). It has always had the rainbow in it…. I left it for about 10 minutes… Worked great.. 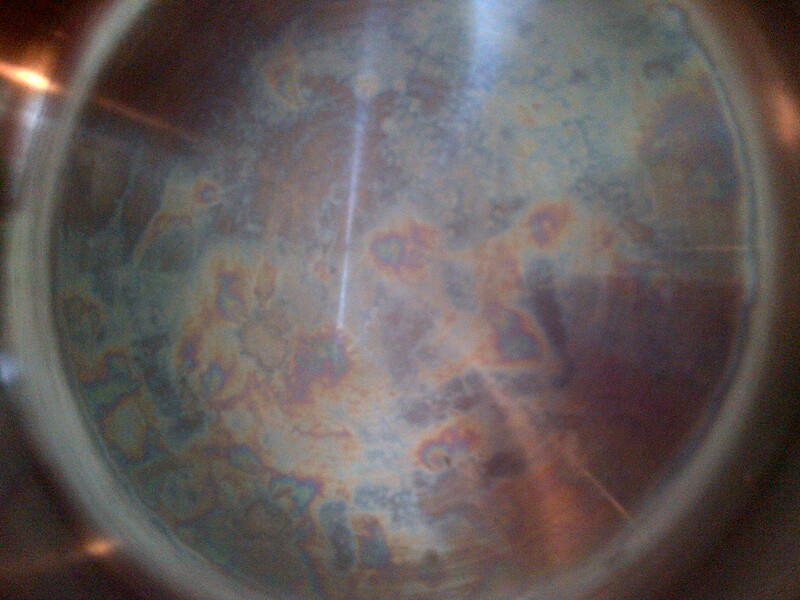 The rainbow patterns appear when the metal of the pan is chemically modified. I wonder how can vinegar restore the original appearance of the metal. Have to try and check it someday. I’m not sure of the science behind it, Jim, but I know it definitely works. I hope you give it a try! Thank you! I just got a beautiful new set from my in-laws for my birthday and was sure I just ruined them after the first time using them! Great tip! Hi, I have a different issue. I bought a brand new set of all the pots and pans and love it! Except for the fact that it seems to leave a stain, not rainbow but a stain of whatever I cooked in it. I have tried the cleaning immediately while the pan is still hot. I’ve tried putting vinegar in the bottom of it to soak. I even tried the baking soda and lemon method I heard from another individual still no success of getting it squeeky clean. I read that you are not to use abrasive cleaners so dawn is all i use. Occassionally place in dishwasher , mostly hand wash. Your advice does help on the rainbow after being in the dishwasher. Any other cleaner choices? Thank you for this advice. I was able to remove the rainbow discolorations inside all of my stainless steel pots. Wonderful advice. Thank you! Thank you! Thank you! My brand new inlaws have been staying with us after the La flooding. My father in law likes to do dishes every morning. We usually wash our stainless pots by hand, but he puts them in the dishwasher. I hated to say anything, and then I noticed our 4 month old wedding present pots with the rainbow stains. I was crushed, but then I found this! And it worked way better than I ever imagined! I wish I took before and afters! Oh, Liz, thank YOU so much for taking the time to leave this comment. I’m so truly happy you found my post and that it worked to make your pots look beautiful again! Thank YOU for leaving such a nice comment, Sara. I’m so glad my trick worked for you! Will this work also if my stainless steel pots have a dull look to them, they don’t show that rainbow look (although it did at one point) now it looks like they aren’t clean. I am not sure if I am using the correct soap or what, I just use dawn dish soap. I figured if it worked to clean the oil out of duckies they would work to remove grease out of my pan. It’s worth a try, Ana! I certainly don’t think vinegar would harm your pots. Hey Cathy, thank you for your tips on removing rainbow stains. You’re welcome! I’m so glad this trick worked for you. I, too, googled how to remove rainbow spots from stainless steel pots. Of course the spots don’t inhibit the functioning of the pans but they sure were looking ugly. I spent a fortune on my stainless pots (as you all did) and they just were so ugly with not only the rainbow look but white filmy spots. I saw your post and thought it was too good to be true. I had been reduced to using brillo pads (I know, you aren’t supposed to use those but I was desperate – it didn’t scratch the pans) , various cleansers – everyhting I could think of but never thought of vinegar. It worked like a charm – I can’t believe it. For anyone wondering, I’ve put my pots in the dishwasher occasionally. This worked on everything. Cathy, you are a genius! That’s probably the best tip I’ve found online yet! Thanks so much! Thank you enjoyed your colourfull writing skill. I got the rainbow the first time I used my new pans, and read thus suggestion. I always have a spray bottle of vinegar and water mixture on hand for various kinds of spot cleaning and tried just spraying it with that, and it worked like a charm. The instruction book that came with my pans recommends boiling a vinegar and water solution in the pan for baked on stains, so that might be worth trying too, in case of need. I love this blog Cathy ! I got really pained to see my newly acquired pot look like this. I tried your tip and it worked like magic. Thankyou ! you made my day. Thank you for taking the time to comment, Becky. I’m so glad this tip worked for you! Your article is awesome. Can you tell me how I can remove burned stain from my oxo good grip stainless steel cookware set. Which cleaner would be the best? I’m so sorry to hear about the stain on your cookware, Sabrina. I’m not sure if there’s a specific cleaner for that or not, but you might start by giving it a good soak in a some hot, soapy water. Good luck and thanks for your comment! With practice, I’ve gotten better by trying not to cook things at such a high heat, unattended, or too long and taking the pan off of the hot shut off burner instead of just turning the burner off to avoid bad burns. When I burn one, I first put hot soapy water in the pan to the depth of the burned stuff and let it sit a few hours or overnight and scrape off the crispy bits with something non-scratch. Then, if I need to, I make a paste of baking soda, water and detergent, smear it on, and let it sit overnight or longer. Clean that out with a non-scratch scrubber and repeat as needed. 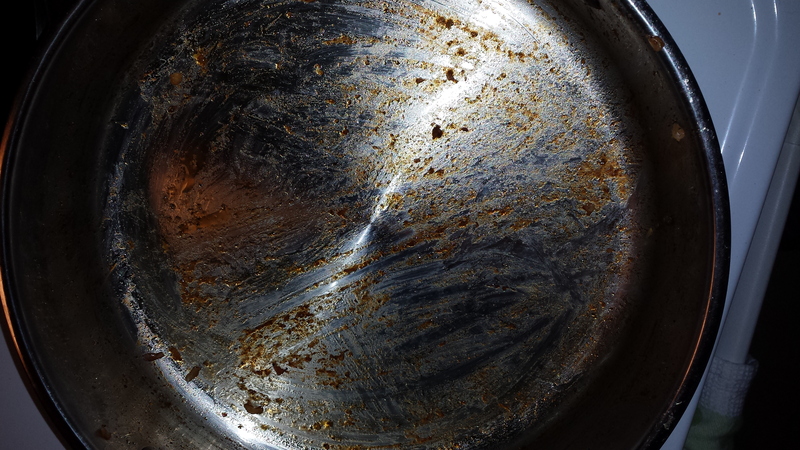 I cleaned a friend’s “green” fry-pan that had a burned glaze of cooked oil on it (from her daughter) that way. Took a few days. In the process of finding this I found lot of folks use vinegar and baking soda at various temps to clean the crispy stuff. That sound’s faster. The thing is if you didn’t clean the vinegar off promptly you could pit the pan. Thank you this worked on my farberware pots! If it doesn’t come out right away just leave the mixture a little longer and yes it works! Funny thing I use white vinegar for lots of clean ups and never did this until now! My farberware pots are saved! They are 30 years old to present! I hate to tthrow them out! Now I don’t have to almost did today until I read your post! You’re a genius, thank you so much!!! I cooked with a brand new cuisinart and had this rainbow stain first time I washed! But thanks to this tip it looks brand new once again! That’s so wonderful to hear. Thank you for taking the time to comment! I’m honestly not sure, Nat, but I think the safest bet would be white vinegar (which also happens to be the least expensive). Good luck! White vinegar is usually available in gallon jugs. (Much cheaper.) And is useful for all sorts of cleaning, especially taking water mineral build-up out/off of coffee makers, humidifiers, dehumidifiers, showerheads, etc. Apple cider vinegar worked great!!! Thanks. I used to scour my pas but my new pans said don’t do that. So then I started getting rainbows after using baking soda to scrub and running them through the dishwasher. I look forward to trying this vinegar. Thanks! Good b?og post. I definitely appreciate this site. Oh my goodness! Thank you SOOOO much Cathy! I was downright angry when I saw my brand new SS Breville pot with rainbow coloring straight out of the dishwasher! This trick worked like a charm. I actually took before and after photos, but don’t see where I can post them on here? How about the rainbow on the outside. Works well on the inside. I’m not sure about that, but it’s worth a try! I bought stainless steel pot was cooking meat and it left rain bow stains and ihave a metallic taste in my mouth what should I do ? I too, freaked out at the rainbows on my Costco set. I actually returned the $270.00 set today. Now I wish I haden’t. Thank you for the great tip. Thanks so much Cathy! I was so disappointed after cooking in my new stainless steel set until I tried this and it worked beautifully! !…this tip was the perfect solution as well economical!!! I walked out this morning to see a horrible rainbow stain in our stainless kitchen sink. I’ve had this sink for a long time and just love. Nothing like this has ever happened before, and we can’t figure out what may have caused it. Like others, I googled and saw a picture of your stainless pan. So I followed your instructions and, voila’, no more rainbows in the sink. Thanks so much! Thanks for this helpful post, it came in a good time xD. I was wondering if there are any other alternatives of white vinegar that would guarantee same results or even better. This is really helpful! I tried it and it worked on mine. Anyways, thank you for sharing this. Cheers! Thank you, thank you, thank you! I tried it and it worked!! I’m so happy and I shared it with a friend and it worked for her too! We have an question. How do you remove the rainbow effect on the OUTSIDE of pans/skillets. We tried the vinegar on the outside and it didn’t work. Any suggestions/advice! Thank you again, Sue. Thanks a lot. I used in order to scour my passing but my brand new pans said do not do that. So then I started getting rainbows after using baking soda to scrub and running them through the dishwasher. I look forward to trying this vinegar. Thanks for shearing! Thank you so much! I recently bought some lovely new pans and one of them quickly discoloured – thank you for this brilliant tip which worked like a dream. Pan is back to former glory! I have a stainless steel pot I burnt dry with water in it , Tried this vinegar method but the grey patina still remains is there another way to remove it or is it still useable . I love my pots . I also combined the water, baking soda and vinegar and then boiled it for a few minutes and viola…..did it all and even worked better for me that way. when you have the opportunity, Guess I’ll just book mark this blog. I thought I was the only one who is having this problem. Apparently, I’m not alone! Thank you for sharing this, I badly needed to have knowledge in this aspect. Best cleaning tips I’ve ever read! Thank you sooo much for sharing this very helpful post!